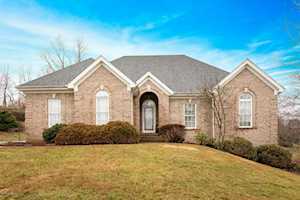 Located off Highway 42 in Prospect KY, you’ll find the lovely neighborhood Hunters Ridge. Homes in Hunters Ridge were developed in the 2000s. Homes range from $260,000 to $440,000. Hunters Ridge features traditional style homes that are mainly two-story. Almost all the homes in the neighborhood are brick. Acreage varies in Hunters Ridge. On average, homes have .30 to one acre. Many of homes in the neighborhood have in-ground pools. The Hollinden Team updates this search for Hunters Ridge homes on a daily basis from the Louisville MLS. Feel free to use the Advance Search Tools of our Louisville MLS to find other houses for sale in Oldham County. Click the map to the left to view each home in Hunters Ridge. There is a satellite view button in upper right. Hunters Ridge homes feature 1700 to 3200 above grade square feet. Most of the homes have basements, and many of the basements are walkout. Two to three full bathrooms and three to six bathrooms are typically what you’ll see in Hunters Ridge homes. Because of the age and price point of Hunters Ridge homes, most homes have modern day updates. Open floor plans and vaulted ceilings are common in Hunters Ridge homes. Prospect offers many options for places to shop. Grocery stores are located close by Hunters Ridge. There is a Kroger in Prospect located at 5929 Timber Ridge Dr. There is also a Walmart close by Prospect located at 3706 Diann Marie Rd. Nearby shopping centers include The Paddock Shops and Westport Village. You can find such stores as Express, Barnes and Noble, Gap, Victoria Secret, Bed Bath & Beyond, and Bath and Body Works at The Paddock Shops. There are also several restaurants at the Paddock Shops such as Five Guys Burger and Fries, Stoney River Steakhouse and Grill, Martini Italian Bistro, and Potbelly. Westport Village has many great boutiques, restaurants, and salons. A few of the boutiques are Apricot Lane, Tunies, and Darling State of Mind. A couple restaurants that you should try are Artesano Tapas Vinos Y Mas, Napa River Grill, and BoomBozz Craft Pizza and Taphouse. If you looking for an excellent place to taste and explore different types of whiskey, spirits, wine, and beer you should check out Westport Whiskey and Wine. Prospect offers many dining options. Some of the local’s favorite restaurants are J Harrod’s Restaurant, Cast Iron Steak House, Hanabi, The Blackstone Grille, Bistro 42, and Prospect Café. Prospect has several great golf courses to choose from including Hunting Creek Country Club, Nevel Meade, GlenOaks Country Club, and Sleepy Hollow. Hunters Ridge is in the Oldham County School District. The following schools are the home schools are Hunters Ridge: Goshen Elementary, North Oldham Middle School, and North Oldham High School. Goshen Elementary School and North Oldham High School are two of the four schools of distinction in the Oldham County School District. North Oldham Middle School is one of the four highest-performing schools in the Oldham County School District. If you would like to learn more or have any questions about any of these Hunters Ridge houses for sale, or others in the zip code 40059, just click the "Request More Information" button on any property detail page. The Hollinden Team can provide you with past sale information, comparables, disclosures, PVA assessment, and tax information – we would love to answer any real estate questions you have.